RIORI Vol. 1, Installment 4: Woody Allen’s “Midnight In Paris” (2011) | "Rent It Or Relent It"
Owen Wilson, Rachel McAdams, Marion Cottiliard, Tom Hiddleston, Alison Pill, Corey Stoll, Adrien Brody and Kathy Bates. Would-be novelist Gil visits Paris with his fiancé and her family to soak up the local culture. One night, after too much family time, Gil hitches a ride in a classic Peugeot and finds himself magically transported back in time to the Paris of the 1920’s. Gil finds rubbing elbows and trading drinks with Hemingway, Fitzgerald and other luminaries of the ex-pat Jazz Age sure beats yet another jaunt to the Louvre. I only like good movies. I often scan AllMovie or Netflix to see if my opinions of movies match up with what either the critics’ takes are or what audience ratings indicate. But are the films good because they jibe with what strangers have to say? Because there are other like-minded people out there with agreeable opinions such as my own? Is this snobbery? Everyone thinks that his or her tastes are great. Folks can get pretty heady about such stuff. I dunno. Maybe. Like I said, I only like good movies. Maybe I was little too harsh in my last installment, covering the mindwipe that was Drive starring Ryan Gosling and Bryan Cranston. It wasn’t all bad. It had its moments. It just wasn’t what I wanted to expect (and I didn’t really know what to expect). I still wouldn’t recommend it though. What I’m saying is a little thoughtfulness in my critiques might be a welcome thing. I can rail with the best of them, and when a film is disjointed, poorly paced, fails to follow interior logic, or if the acting is just plain dumb, I get cranky. But still, I feel a little thoughtfulness can go a long way. Like this is a crime. We as filmgoers are already fed to the choking point—mostly during summer—with so much pabulum already, one would think a intellectual film that did well at the box office would be a good thing. I think it is. I’ve seen enough lowbrow films in my day (and don’t get me wrong, I find I like any Adam Sandler movie that has him playing a sport delightful. Too bad there are, like, only two) to bang my head against the wall and spit up my popcorn, threatening to walk out of the theatre. But I also like my Fellini, Kurosawa and, yes, Woody Allen films too. Most of those are thoughtful, smart pieces of cinema that could be or were popular. So what’s wrong with “smart film?” Does it make the average moviegoer feel dumb? I heard somewhere that there was a theater warning patrons that Terrence Malick’s Tree Of Life had, not graphic violence, sexual situations or extreme language, but “philosophical overtones and existential themes”. Stop the projectors! This was a warning. A warning. To average citizens. About smart sh*t in a Brad Pitt movie. Huh? This is a bad thing, apparently, according to the laymen. Here’s a fact: people are stupid. I don’t mean people in general. I mean the collective sheeplike hive mind that is the nebulous concept of “people” is what is stupid. “What do they know?” is a phrase bandied about by all of us at one point in time. “They” is people, and if people are made to feel stupid, then they get what they deserve, and’ll probably miss out on cool sh*t and die angry. If this premise appeals to you, apparently it didn’t appeal to the masses. Well, some of the masses. I guess I’m one of the few that found it appealing; otherwise I wouldn’t have rented it. Woody Allen’s films have almost always been intellectual, even the dumber stuff like Bananas and Sleeper. 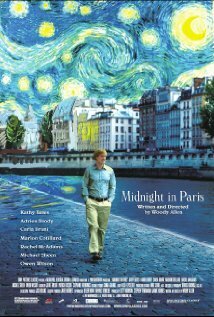 Midnight In Paris is the only movie in his filmography that I know of that has been so overtly intellectual. At lease, appealing to the intellectuals out there. Am I saying that I’m an intellectual? Hell to the yeah. The notion of conversing about writing and getting tight on absinthe with Papa Hemingway charges me up. Watching Gertrude Stein argue with Pablo Picasso about each other’s interpretations of a portrait? Bring it on. Having Dali want to do and abstract portrait of me? “The Temptation of St. Anthony” is my favorite painting. Does all that bother you? All that name-dropping? It would bother me too if I were outside the circle that Allen tries to condense into an hour and thirty minutes. It’s easy to see why folks could get alienated. The whole film is virtually a holy host of 1920’s celebs, too many for the hoi polloi. Too many writers, too many artists, too many non-Internet (save Wikipedia) connects to catch up with the times. Enough about the dividing lines. What brought this film together for any smart audience to appreciate? For one, the opening montage is great. Dozens of scenes showing off everything you need to know about Paris. The winding streets, the cafes, the out of the way places. Here is the setting. Adjust to it for the next 90 minutes, yer gonna be walking it. Good news is you won’t sweat. Owen Wilson is at his Owen Wilsoniest here. Charmingly awkward. Wilson always has this air of “I’m in the wrong place” in most of his films, and it works really well as he Billy Pilgrim’s it between 2010 and 1920. This awkwardness translates into childlike wonder when Gil goes back in time and hobnobs with the writers and artists he meets, especially when he starts crushing hard on Picasso’s dame, Adriana (played gamely by a lovely Cottiliard). Yet on the flipside, this is a more mature Wilson, not so quick to act goofy and clueless to grab a laugh. This is not a laugh-out-loud film, but using Wilson as a guide, you get snickers. Following his childlike enthusiasm for this newfound world, you have to laugh inspite of yourself. It’s hard to be cynical with a movie like this one. It’s the 1920’s, right? That means jazz and gin and flappers. The costumes are great. Everyone is nattily dressed in the attire of the times. Sumptuous attention to details. The backdrops to Gil’s fantasy world are so inviting that even if you’re not a big deal reader or even writer, you’d like to dip your toes into a party where the Charleston rules and gins flows like icy water. And as always, Allen’s soundtrack is tasteful and thoughtful as ever, too. Notable acting is key. Head and shoulders over the cast is Corey Stoll as Earnest Hemingway. His script is tight, just like his prose. And he has this stare that is just so convincing. Allison Pill as Zelda Fitzgerald is a hoot too, flapper incarnate and perpetually drunk and borderline psycho. Good stuff. The whole film had a sophisticated Twilight Zone feel. Man hates present. Man visits past. Man wants to stay in past. The past in not where he belongs. The film questions the idea of a “Golden Age.” I’ve read somewhere that a Golden Age is when you were 12 years old. Despite the fact Gil is well over twelve when he takes his stroll into the Parisian version of the Zone, his juvenile enthusiasm is infectious. Even if you’re not a self-proclaimed intellectual, you can appreciate what’s going on. This movie isn’t about who you rub elbows with, it’s about being comfortable with yourself. In your own shoes. Hell, there’s a message we all should hear once in a while. With or without the bathtub gin. The set pieces were amazing. I mean, I wasn’t extant in the ‘20’s, but it gave me the feeling of realism all the same. And I guess during America’s Prohibition years, Paris was the place to be. My uncle taught Owen Wilson at St. Mark’s. And his brother Luke. And Old 97’s singer Rhett Miller. Just sayin’. Jake Gyllenhaal, Robert Downey, Jr. and Mark Ruffalo form a wobbly alliance to hunt the Zodiac. Let’s hope they got enough crossword puzzles. This entry was posted in Comedy, Movies and tagged Adrien Brody, Alison Pill, Corey Stoll, Kathy Bates, Midnight In Paris, Owen Wilson, Woody Allen. Bookmark the permalink.